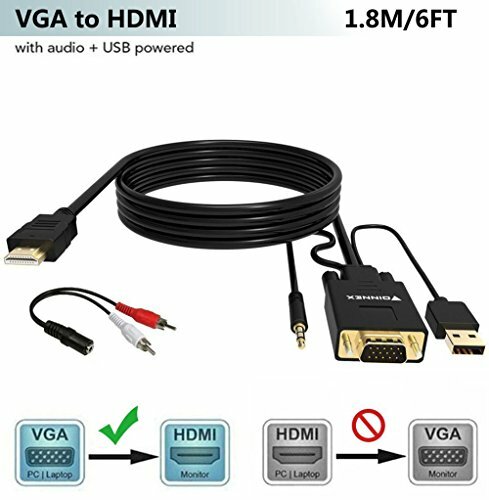 FOINNEX VGA to HDMI converter cord allows you to convert VGA output from PC/Laptop/Desktop to your TV/Monitor/Projector with HDMI input. You only need to connect video signals from your computer to your TV. Share your video/audio/data from computer or old-styled notebook,desktop,laptops that has only VGA (D Sub,HD 15-pin)ports to any HDMI-equipped devices like TV monitor, projector for big screen viewing. Supports Video and Audio Synchronously. VGA HDMI adapter cable supports stereo Audio transmission via a 3.5 mm AUX Mini jack cable or 2 RCA plug (Y-cable adapter included). Support VGA resolution from 800*600 to 1920*1080 input; Support resolution up 720P/180i/1080P HDMI output. 1.Insert the VGA into the computer(desktop or laptop etc.) with the VGA output. 3.Connect the HDMI with the display device (TV, monitor,projector etc.). 4. If there are more than one HDMI inputs on your display device. Generally, signed as HDMI 1/HDMI 2,/HDMI 3. Before connecting this HDMI cable to TV, Please select the corresponding HDMI input interface on your TV screen. This VGA to HDMI converters cables is NOT bi-directional. It only converts from VGA ( analog signal output such as PC/laptop/HD TV-Box) to HDMI (digital signal input such as monitor, HDTV, projector).Can NOT be used as a HDMI-to-VGA converter cable. For HDMI-to-VGA cable,please refer to ASIN "B07C846D7L". Cost-effective: No need any extra HDMI cables. BONUS a RCA Left/Right stereo audio to 3.5mm AUX adapter cable to get audio signals from DVD,TV-box and more devices with RCA output. Supports Video and Audio Synchronously. VGA output/HDMI output supports video resolution up to 1920 x 1080/60Hz, Supports 24-bit;Transmit stereo audio via male 3.5mm AUX Mini Jack or 2 male RCA stereo audio plug. Plug and Play.The USB connector MUST be connected to get power for the bulid-in active VGA-HDMI chipset.Compatible with Windows, Linux OS. ONLY FROM VGA-TO-HDMI Displays (TV/monitors).It only converts from VGA (analog signal output ) to HDMI (digital signal).Can NOT be used as a HDMI-to-VGA converter cable.For HDMI-to-VGA cable,please refer to ASIN "B07FT2VLVJ".